This short dance film is my third and final project for my first semester at Ohio State University. The instructor allowed for this project to be completely open, no guidelines or restrictions for our creativity. I found it easy to conjure up an idea; however, I found it challenging to figure out how to make that idea become a reality throughout my filming and editing process. Because of the constant struggle and perseverance throughout this past month, I feel like I was able to create something that I am proud to present to you all. This short film is inspired by a true event in my life. I was forced into isolation for four hours in a claustrophobic space, yet it felt like an entire day. Thoughts of my loved ones, my past actions, and my future goals were all whizzing through my mind without interruption. No matter how hard I tried, I could not sleep, could not eat, and could not stay still because of the anxiety that started to destroy my psyche while I was contained. Although it was one of the most tragic moments of my life, God helped me to use the experience to turn my life in a positive direction. I wanted to share this with you all at this time of thankfulness because I am so grateful for this moment in my life and the inspiration it has given me to live better, and to create this film. I hope you all find a connection with something in the story and enjoy the 5-minute experience. Thank you for watching! Blessings. P.S: Shout-out to the beautiful dancer Julie Kogan! Thank you so much for all your help in this process, I hope this work gives justice to your awesome-ness! Much love! P.P.S: I wanted to give a shout-out to the amazing Hiphop choreographer, Ellen Kim. I used her choreography from “Back to Cali” by Biggie Smalls that I learned in Washington D.C at a Movement Lifestyle Tour. I really connected with the movement and wanted to experiment with using a Hiphop choreography in a different way. This is my second major film project from Ohio State. We were required to pick a piece of artwork and create a short movie based off of what inspired us. I chose a piece of artwork of a Krump dancer in open space. There is no title or artist; however, this work has inspired me for years now. For me, it represents the freedom of giving yourself up to the Lord. I used the artwork to create Faceless, a short film based off of the masks that individuals wear when they are interacting with others in society. We rarely, if ever, show our entire selves when we are living amidst society. More so, we put on different masks to show portions of ourselves depending on our situation. 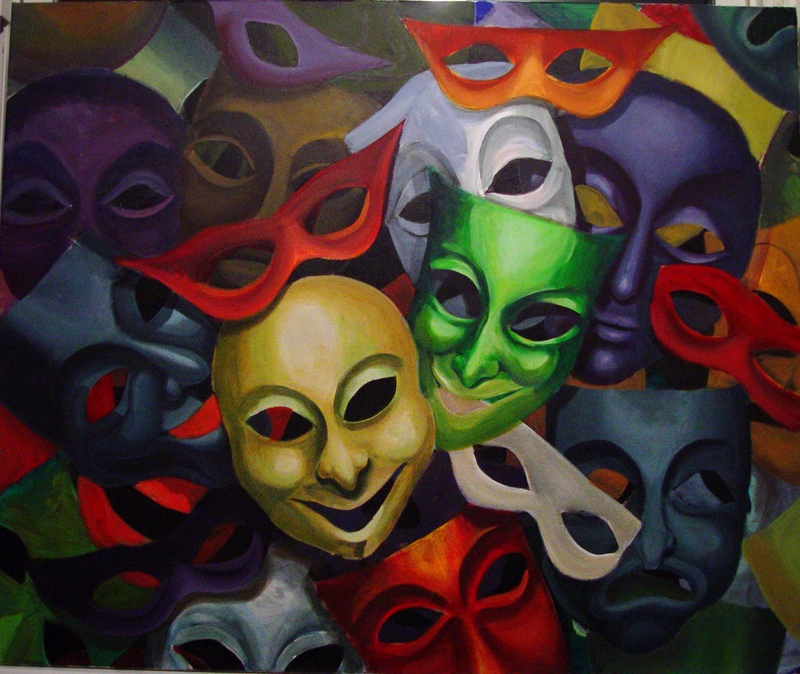 This film explores the pressure that builds upon us as we put on these masks in order to be accepted and meet expectations in society; and then, the breath of freedom that comes with escaping society and allowing our true selves to be expressed without restraint. I hope you enjoy and take something away from the piece. Blessings. “First Mark” is my first dance film project created here at Ohio State University. We were required to choreograph 2 movements and film the movements from 22 angles. Using our clips, we used our creativity to tell our own story. The title represents the last name of the dancer, Mel Mark, and my first step into making a difference in the dance field here at OSU. Special thanks to the dancer, Mel Mark. Freshman dance major at OSU.